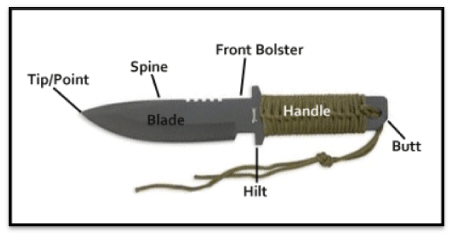 A survival knife is arguably the most important piece of equipment in a survival situation. In a survival situation a survival knife can be used for hunting and skinning, cutting wood and rope, opening packaging, self-defense, and a myriad of other things. Survival knives are used by military troops, hunters, and outdoor enthusiasts among others because of their wide range of uses and relatively small size. Survival knives are available in a wide variety of shapes, sizes, and functions. Each knife has specific strengths and weaknesses that should be carefully considered when choosing the right knife for you. Survival knives are designed for typical tasks encountered in a survival or emergency situation – cutting branches, setting animal traps or fishing, skinning animals, cutting rope, etc. Most survival knives have 10-20cm blades and a full tang. On some knives the back of the blade (spine) is flat, making it a useful hitting platform for tasks like splitting wood. Other knives have a serrated spine. While useful for sawing, serrations in the blade do weaken it. Recently, manufacturers have begun adding tools such as compasses into the cap, or designing knives with hollow handles where small tools like matches. A hollow handle will tend to compromise the overall strength of the knife and may leave it prone to breakage if used for blunt force tasks like splitting wood. The handle of survival knives can also differ among knives and knife makers. Survival knife handles can be made of hard rubber, bone, wood, metal, or even polymer. Some knife handles are wrapped in cord or some other material that is either useful when removed or lends better and more comfortable grip to the handle. The handle of a survival knife is very much a matter or personal preference and comfort. Widely accepted as the best survival knife. They’re durable and made to take abuse. Fire and shelter building, hunting, prying things open, splitting wood and chopping branches are just a few things a fixed blade knife specializes in. Not quite as durable as a fixed blade but can still be a great option. Folding knives are more compact, lighter, and easier to carry than a fixed blade. A folding knife is a great option for a car kit, for example, where a fixed blade may be a bit of overkill. A good folding knife should lock in the open position and you should be able to open it with one hand. Maybe not the best survival knife in a wilderness survival situation but they are certainly a handy mini tool set that can be easily carried and come in quite handy. Many survivalists recommend carrying a multi tool in addition to a more comprehensive survival knife. Different blade shapes serve different purposes; therefore the shape of a blade determines its ideal uses. 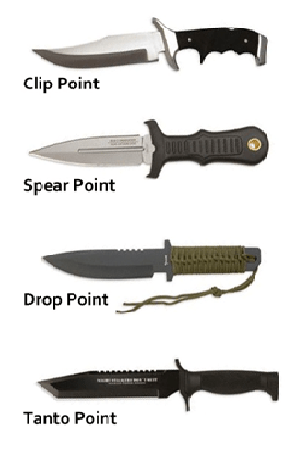 In general, drop point knives and clip point knives are the best for wilderness survival situations. Double-edged spear point knives and tanto-style knives are built for thrusting and stabbing associated with fighting but are unable to perform important survival tasks like batoning to cut wood.